I wonder how many members of the 'Better Together' campaign choked on their cornflakes recently on reading that the 'Bible' of their self-styled 'Intelligentsia' - The Financial Times - had published details of how successful Scotland would be from Day 1 of obtaining Independence. "Among the blizzard of contention and spin that surrounds the independence debate, some points of broad consensus are clear. Nationalists argue that being part of the UK has held Scotland back, while their opponents contend that the union has been central to its economic success. But the leading players on both sides accept that Scotland has all the ingredients to be a viable nation state. 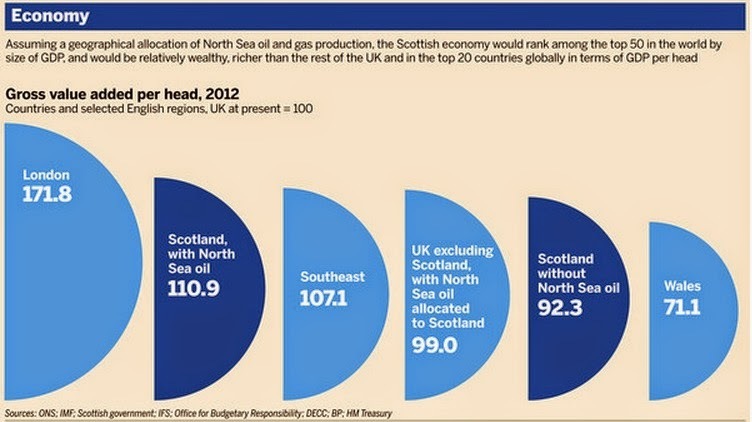 "If its geographic share of UK oil and gas output is taken into account, Scotland’s GDP per head is bigger than that of France. Even excluding the North Sea’s hydrocarbon bounty, per capita GDP is higher than that of Italy. 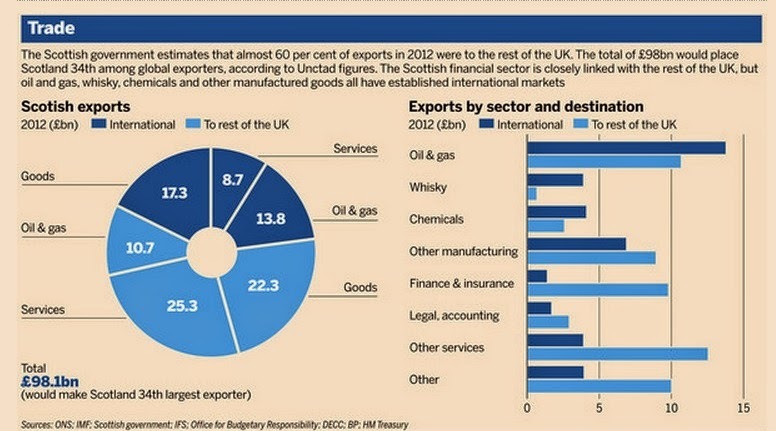 Oil, whisky and a broad range of manufactured goods mean an independent Scotland would be one of the world’s top 35 exporters. "An independent Scotland could also expect to start with healthier state finances than the rest of the UK. Although Scotland enjoys public spending well above the UK average – a source of resentment among some in England, Wales and Northern Ireland – the cost to the Treasury is more than outweighed by oil and gas revenues from Scottish waters. Analysing the Financial Times figures is both fascinating and revealing. Their calculations are shown in clear graphics, and so immune to any ambiguous interpretation. This is equivalent to £1,321 a year for every man, woman and child in the country, or £5,812 a year for the classic 2.4 children nuclear family.